Turn this plastic mason-style jar into your own little habitat with real plants and tin figurines. Set includes a 5″h x 3 1/4″w jar, decorative lid, potting mix, organic chia and wheat grass seeds, garden figurines, decorative sand, river stones and a plant mister. 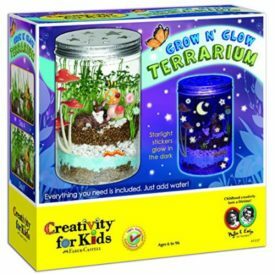 Add dimension to your garden with translucent and glow-in-the-dark stickers – hold it up to the light and watch the fireflies glow. The perfect STEAM activity that mixes science and art. Create your own eco-system and learn about botany and the life cycle of plants. Your habitat will begin to grow in as little as 3-4 days. Fun and educational. The final result is amazing, the seeds in the kit grew quickly (about 24 hours) and well, and it’s manageable for kids, who are able to take ownership of the project and feel proud of the results. It’s cheap, it looks beautiful, it works, and it teaches a lot about biology/botany and responsibility. Easy win all around!